The area was familiar to us. We had been here on multiple other rescues. We left the shelter to check on a dog “just lying there” in an open field. We had no idea we would be out in the cold for hours on a life-saving mission. As soon as the dog spotted the jeep, she got up and trotted off. She remembered us from other rescue attempts. We could see that she was either currently nursing or has recently been nursing puppies, so we decided to follow her. This mom is very street smart and didn’t let us get close. But she went to the same alley we had lost her in on previous attempts. 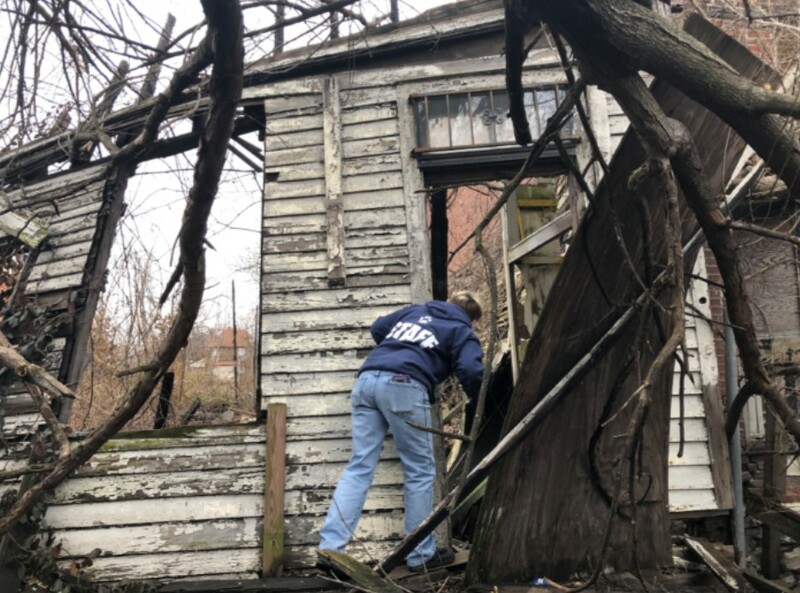 It didn’t take much time searching abandoned houses before we heard a puppy bark. 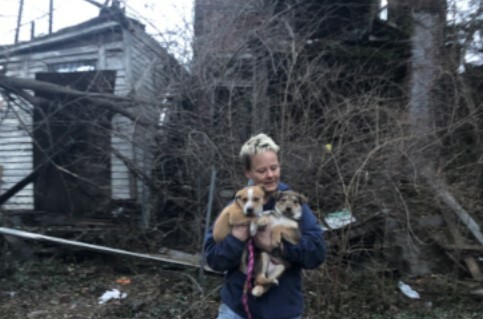 We spotted two, chunky puppies underneath the collapsed house with the burned floor. The boards were charred and there was ash and pieces of wood everywhere. We tried to sneak up on them. It sounded like a good plan, but as soon as they realized I was right above them, they bolted. For the next 4 hours we searched. Cold and dirty, we started to lose hope. Donna searched every inch and left no stone unturned. We tried a couple of other strategies, but patience was the one we needed most. Before long, one puppy was spotted running into the basement of the house next door. I knew we would finally be able to get this one, there was only one way out of that basement. The flashlight was rapidly losing power and kept going on/off. I finally had to resort to the light on my phone. There was no peep out of the puppy whatsoever, so I just had to keep looking. Then, the cutest little puppy face looked out from behind a board. I tipped the board away from the wall, slipped the leash on the puppy just in case and picked him up. He didn’t squirm or make a sound. I know he was terrified, but it felt good knowing the first one was safe. We were not leaving without the other puppy. 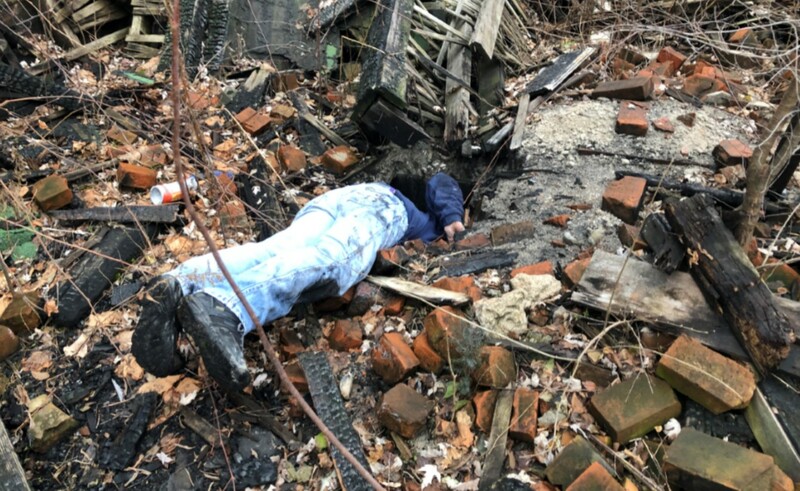 We only had about ½ hour of sunlight left, so we decided to go look around the rubble again. We heard the faint puppy bark from the basement again. This time, the puppy was huddled in the corner, behind an old table. It collapsed as we moved it to get to the puppy out. This one wasn’t as quiet as the first, but as soon as we had her picked up and safely in our arms, she relaxed. We found her just in time. Now that it was completely dark, we would have to come back the next day to try and rescue Mom. Please donate today to keep our rescue initiatives going!